Deadline sneak up on you? Never enough time? You feel like you spend more time in meetings than out of them? You try to get work done but keep getting interrupted? I know, right? It’s like I know you. You’re not alone – I feel exactly the same way. When it comes to managing my time, sometimes it feels like I’m losing the battle, the war and maybe even the will to live. Still, it doesn’t have to be like this. I’m sharing some of my favourite calendar management tips. Sure you’ll still have your bad days, but follow even a handful of these tips and I promise you will be in charge of your schedule, manage your time and smash your goals. 1. Review. Then review again. Review your calendar at the start of every week (Sunday night is best). See what meetings you have and list any action items and preparation you need to take care of. If they’re important, then block time in your diary to make them happen. Then review again. Every day. I do this first thing in the morning (weird how things can change overnight – business never sleeps anymore does it?). I also have another scan about 30 minutes before I finish to see what I got done (and what I didn’t) and take a peek at tomorrow so I can get a head start. I’ve learned that our opinion of what was important on Monday can change by Wednesday. It’s also easy to forget a meeting or overlook something you need to do. That quick check-in has saved me many, many times and I’m sure it will for you too. Allow yourself one meeting free day a week and do your best to protect that time at all costs. Even if the boss says she needs to meet with you on the only day you’ve got nothing on – offer an alternative if you possibly can. I need to focus on deep work, and you do too. Busy being busy does not get you a pay rise at the end of the year. So your “free” day is actually far from free. It’ll give you time to think, contribute to long-term projects, tackle the to-do list, demolish emails and power through your admin. Go on, give yourself some quality time. You deserve it. If you know you need a meeting, get it on the calendar as soon as you can. The longer you put it off, the more likely you are going to have scheduling issues or conflicts. Make sure the purpose is clear and everyone knows why the meeting is in place and what they need to prepare. I always send my calendar availability up front. it can go a long way to avoiding those endless emails trying to figure out a time that works. Perhaps this is more a productivity tip than a calendar management tip because using a meeting scheduler will save you an enormous amount of time when trying to schedule meetings. If you’re using Outlook on an Exchange Server, you won’t go wrong with the humble Scheduling Assistant. When adding attendees the free/busy grid shows the availability of attendees so finding a time that suits everyone is straightforward. Outlook Mobile (Android, iOS) has built-in scheduling. When you pick a time that works for everyone, the event is green. When there’s a conflict it turns red. You can also send your availability when asked for a meeting. Just reply to the email, click the calendar icon, select the times you’re free, and Outlook Mobile does the rest. This is a massive time saver. Microsoft’s FindTime which allows you to send a new meeting poll to propose your selected times to all attendees and allow everyone to vote. It then sends the meeting invite on your behalf. Google Calendar offers similar tools to find a meeting time and invite people to select appointment slots. Calendar management tools like Doodle and Calendly offer great free versions for scheduling meetings and integrations with Outlook, Gmail and more. They are an easy way for clients and colleagues to book time with you. Simply set your availability, share your link, let them select an available time and the event is added to your calendar! If you’re asked to do something by a client or colleague, we both know they’re going to chase you for an update. Set expectations by immediately scheduling a follow-up meeting in everyone’s calendar. It’s a simple tip but effective. It’s a great way to stay on top of tasks and make sure you deliver promises on time. You know how sometimes you get on a roll and suddenly you lose all sense of time? A simple and easy way to get back to reality is to set a 5-minute appointment for the time you want to be reminded of something and explain what it is in the meeting subject. Tick the reminder and set it to zero minutes. Time to leave for client meeting – get the train to King Cross then Victoria line to Oxford Circus. Use this trick sparingly. Tasks don’t belong on your calendar – there are much better tools for that. You don’t want your calendar filled with dozens of 5-minute reminders but the odd one here and there can really help you out. If you work with colleagues or clients around the world, then adding a second time zone to your calendar is a great idea. This will show dual times on your calendar – very helpful when planning meetings. Plus it saves you the hassle of Googling “what time is it in…” You can set up dual-time zones on Outlook and on Gmail and most other email clients. If you do have multiple calendars then import them all into your primary calendar. It’ll save you loads of time and if you have overlay mode, you’ll be able to see all your calendars and appointments simultaneously. The setup is generally the same for most applications. Here’s how to do it in Outlook, but if you’re using something else, just Google “import calendar” and you’ll find a how-to-guide. Another of my favourite calendar management tips: keep meetings brief. The shorter the better in fact. 30 minutes should suffice for most meetings. Most calendars default to 30-minute intervals. That’s why you tend to get invited to hour-long meetings when less time is needed. You can change the Calendar time scale in Outlook to whatever you like, so think about modifying it to 15 minutes. It’ll make it easier to setup 15 or 45-minute meetings. There are so many long, boring meetings in my calendar, so if I can’t decline them altogether (see number 10), I’ll try to limit my participation by letting the organiser know I can only join part of the meeting and ask them to schedule me a slot. You won’t always get away with it, but worth a shot, especially for status update type meetings. Is there anything more frustrating than spending an hour in a meeting getting updates you read in 10 minutes? Instead, consider online collaboration, brainstorming and project management tools. Get your team setup on these and encourage colleagues to use them as well. They will reduce emails and meetings significantly if used effectively and give you a lot of time back in your diary. Some of my favourites are Trello, MeisterTask or Zenkit. Free and very effective. It’s time to say hello to the 21st century! This is one of my all-time favourite calendar management tips. 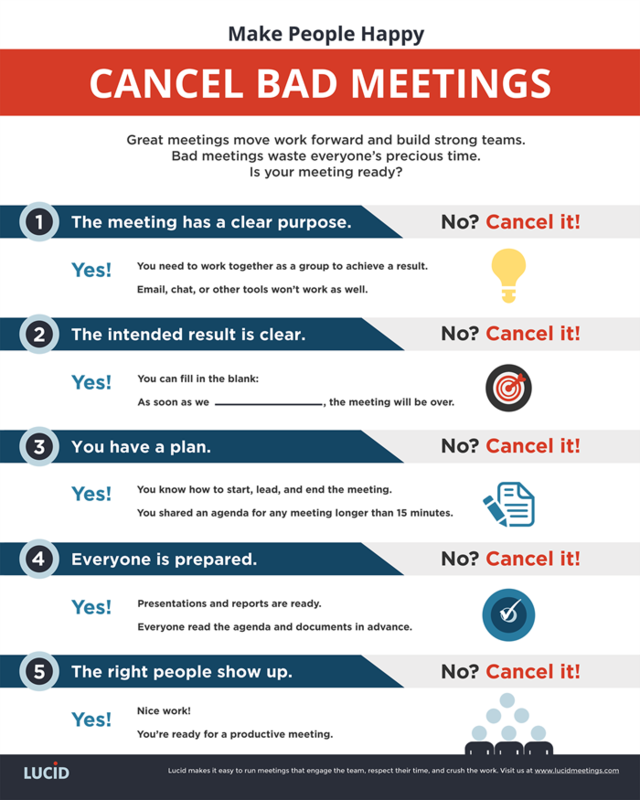 If you don’t know why you should be at a meeting, and the organiser can’t tell you either, then say “No” until they can. You need to be clear on what your contribution is and the value you are adding. If that’s too harsh, try delegating – it could be a good development opportunity for someone in your team. Another trick is to decline, but offer help to the organiser with some meeting preparation so they feel comfortable hosting without you. For example, while you may not be presenting the slides, you can create them. For a face-to-face meeting, sometimes the value just isn’t there. Travelling 3 hours when you’ve only been allocated 15 minutes on the agenda, is not efficient. Question if you’re really needed in person. Perhaps instead of “no”, you offer to attend virtually. Don’t wait for late-comers. Get started. For large meetings skip the roll call. Everyone knows who should be there (just check the attendee list on the invitation if you don’t. Those that arrive late will catch up. Those that don’t turn up, either you won’t miss them, or they owe an apology to everyone. Just about every meeting I’ve attended spends 15 minutes waiting for stragglers and doing a roll call of who’s on the phone, who’s in the meeting room, who sends their apologies. Observe this rule, and you’ll not only finish on time, you might even claim some back! You can’t be in two places at once, despite your super-powers. That’s not a calendar management tip, that’s just physics. If you have a scheduling conflict in your calendar conflict, take care of it immediately. The longer you leave the two meetings in place, the more anxiety you’re going to create for yourself as the day looms near and you’ve done nothing about it. It’s also mightily unfair to the organiser to decline last minute. Prioritise which is the most important for you to attend and not the invitation you accepted first. Sometimes you just need to cancel a meeting. Managing your calendar means just that. Don’t press on just because it’s been scheduled. If the value simply isn’t there, cancel the meeting and give the gift of time. If you’ve got a bunch of meetings, then bite the bullet and schedule them all in a day and do emails in between. That’ll give you a bigger block of free time for another day. Sure it can be brutal, and I wouldn’t make a habit of it, but it can be a good strategy if you need to claim some time in your calendar. If you have back to back meetings, use the countdown function on your phone’s clock to ensure you stay focused on finishing on time. Google has a simple countdown timer with alarm. Set the countdown or alarm for 5 minutes shorter than the meeting duration so you know it’s time to wrap things up (e.g. if it’s a one-hour meeting, set the countdown for 55 minutes). If it’s going to take you some time to get between meetings – just let both organisers know in advance that you’ve got back to back’s so may need to leave a little early, or may arrive a little late. Categorising and colour-coding is awesome. It’s easy to segment and identify personal meetings from business ones and arrange your day. At a glimpse, you have a great overview of your commitments and an easy way to filter what you’re doing over a day, a week, a month. A lot of people (including myself) keep a personal diary and a work calendar. I’ve experimented with using this method and it has helped eliminate the need for multiple calendars. If you give it a try, let me know what you think. This is perhaps THE most important calendar management tip. You can easily spend every minute God sends on email if you allow it. Dedicate only a few hours a day to email. I typically try for 60 to 90 minutes maximum in the morning and same again in the afternoon and block that time on my calendar. The time in between is for actual work. It sounds great in theory and of course it doesn’t always work out like that, but I do stick to that schedule more often than not. I have switched off all email notifications. I’ve also turned off auto send-receive and changed the interval to every 3-hours. This means if for some reason I’m in my email I don’t get distracted by something new that’s arrived. It has also saved my neck a few times because emails sit in my inbox for 3 hours before sending – there’s been more than a few times I’ve intercepted an email that I’m grateful never arrived in some clients’ inboxes. 18. When is your productive peak? We all have an optimum time of day when we’re the most productive. For some, it’s the first thing in the morning. For others, they get their joyous second wind right after lunch. Do you know when yours is? Pay attention to your productivity spurts and avoid meetings during that time. Schedule that time on your calendar for doing work. If you must accept a meeting, make it those where you need to engage, focus, make decisions and participate – in other words, … think. 19. Do you really need to meet? 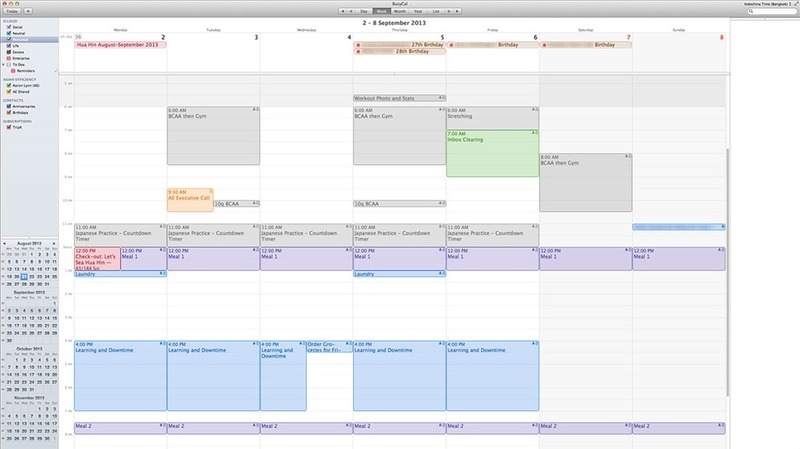 Calendar management isn’t just about scheduling meetings effectively. it’s also about avoiding scheduling them in the first place. 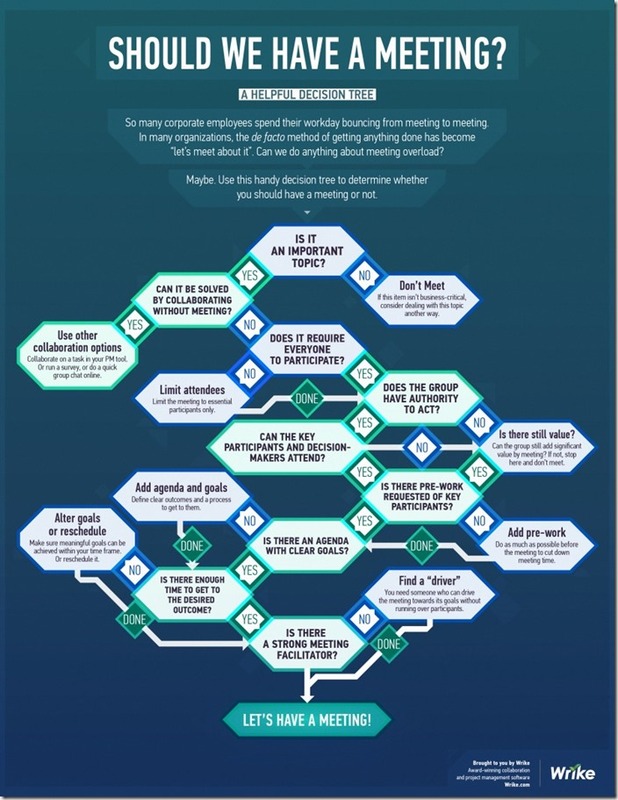 Follow this decision tree and ask yourself if you even need to meet at all. You’ll be surprised how quickly your schedule frees up. We all want to claim some time back in our schedules, so no calendar management tips list could be complete without some time tracking tools. Here are my favourites – all of which are free. Shows you where you’re spending your time. It quietly operates in the background monitoring what applications you work on and for how long and gives you a great snapshot of your activities. See my recent dashboard below. I’ve spent 30+ hours on email. I know. Scary. When you go through your calendar and look back at the month that was and overlay it with your RescueTime dashboard, some patterns start to emerge. You can really begin to see what distracts you, when and why. Toggl offers unlimited and free time tracking for individuals. All you have to do is click the play button and the app will begin monitoring the working hours of your employees. Afterwards, you can go through the generated weekly and monthly data on the total hours spent working. This tool really opens your eyes to how your day is spent and pin downs what you are actually doing and how much time is (or isn’t) wasted. It tracks your activity invisibly and automatically in the background and also has an amazing number of integrations including ToDoist, Trello, DropBox, Chrome, Salesforce and more. They claim to find you an extra 30 minutes of productive time in your calendar a day! “Let’s schedule a meeting” has become the universal response to just about every situation. But is it the right one? 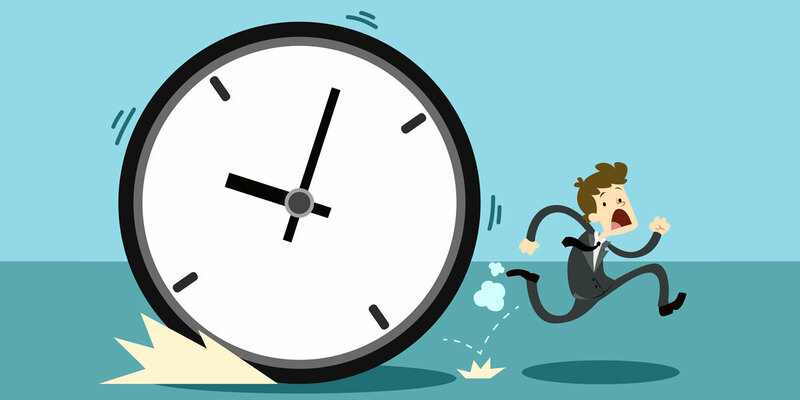 Quiz: How Good is Your Time Management? Just how efficient are you? Take this quiz and find out how good your time management really is. Thanks Tricia!! I also appreciate you taking the time to stop by the site and share your feedback. Thanks so much! Thanks for including TimeCamp in this excellent article, Warwick! Appreciate it! I see that you included here a time management quiz – maybe your readers would like to solve ours! 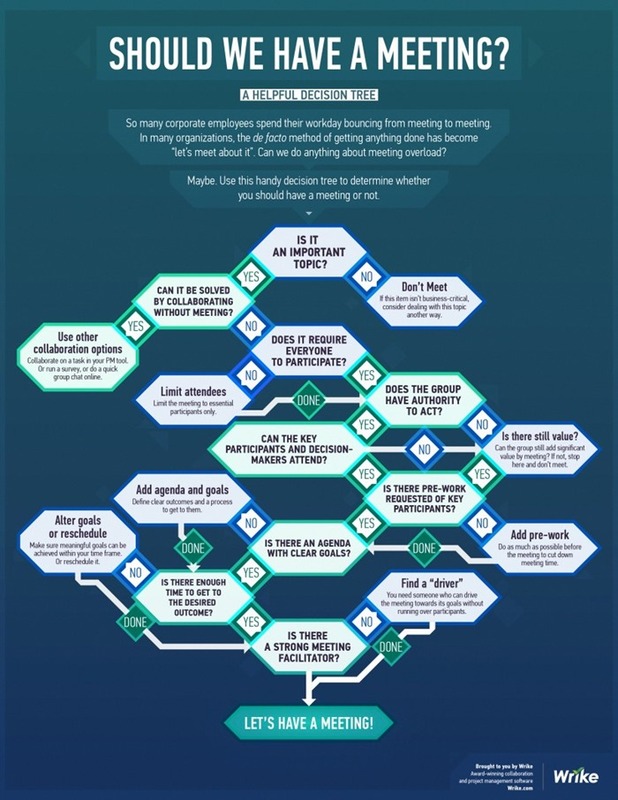 Here’s the link: https://www.timecamp.com/en/effective-time-managment/.